In 2007 and 2008 MTI was contracted to perform all machining and welding in conjunction with the replacement of a steam chest at a fossil plant in Wisconsin. All welding was performed with the orbital GTAW machine welding process. Prior to installation on site, MTI manually welded each side of the steam chest to stop valve. 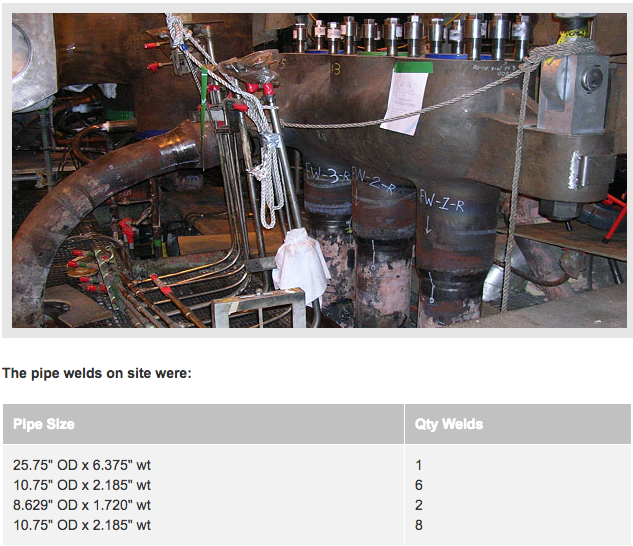 These two welds were 20″ OD x 5.25″ wt. All pipe material was 2¼ chrome / 1-moly. The first two pictures are MTI welders operating orbital pipe welding equipment on site during the installation of the new steam chest. The bottom two pictures show MTE technicians manually welding the stop valve to the steam chest. Customer Case Study – The challenge with machining the 590 header tubes is that 360 of the header tubes required the bevels to be on a 20 degree angle and 3/16th oset from the center line of the through-hole in the header. The 360 oset tubes required us to bore out the existing tube perpendicular to the bore of the pipe with one operation and then utilize our stub tube machine to complete the process with the oset weld prep. All of this was performed with limited overhead clearances. Customer Case Study – MTI Power has the ability to weld with a Narrow Groove or a Conventional Groove Orbital Machine GTAW process, and has successfully completed numerous hot reheat pipe replacement projects. The pipe material was P-22 (2. chrome / 1-moly) and was either 38″ OD x 1.8″ wt or 29″ OD x 1.6″ wt. The welds were in the 2-G (vertical) or 5-G (horizontal) positions with some in limited access environments. During the second project MTI completed a total of 14 standard groove welds and 14 narrow groove welds. Once the project was completed the customer stated he would choose to perform all of the welds using the narrow groove joint design because of the quality and speed. MTI Power has completed its fth Hot Reheat/Cold Reheat Replacement Project for a single client. The last project work scope totaled 53 welds, the majority of which were narrow groove joint designs. 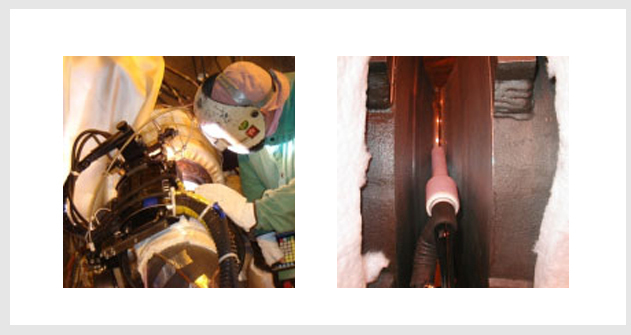 Customer Case Study – MTI Power Services completed two boiler tube machining projects for the same customer at two different power plants that were under construction. Our services were required because all of the tubes in question were supplied with 20-degree bevels on them instead of J-bevels that were essential for the orbital welding process. Close tolerance machining of the tubes was necessary for the orbital tube welding process. The mandatory J-bevel dimension was a 20-degree bevel with a .062″ radius, a land extension of .032″ +/- .005″ and a land thickness of .062″ +/- .005″. The counterbores had to match within .005″ as well. Machine a total of 1972 tube ends that were 1.500″ OD. All tubes were located on the ground with easy access and were not positioned in the boiler. Solution: 1972 tubes on the ground – Tubes were machined by 2 MTI technicians in 16 shifts, working 1 shift a day, 8-10 hrs per shift. Avg. 123 tubes per day / 61 per technician. Machine a total of 2016 tube ends that were 1.750″ OD. All tubes were hung in the boiler and access for machining was the challenge. To complete the machining, all of the tubes had to be pried apart in place to allow access for the machine. Solution: 2016 tubes in the boiler – Tubes were machined by 8 MTI technicians in 24 shifts, working 2 shifts a day, 10 hrs per shift. Avg. 84 tubes per shift / 21 per technician.